The 1977 graduate of Marshall-University High School, who held a state record for assists for 30 years, helped lead his team to a state championship and an undefeated season. It was nearly 43 years ago, but it’s still crisp in Ronnie Henderson’s memory. Henderson’s Marshall-University basketball team was trailing Mankato Wilson by a basket in the final minute of the 1976 Class 1A state championship game. Henderson, who stood just 5-7 but towered over his Cardinals teammates when it came to leadership, saw something out of the corner of his eye. Teammate Jim Ludgate was streaking downcourt, ahead of the Wilson defenders. Henderson zipped a long pass to Ludgate, who converted a fast-break layup to tie the game 54-54 and send it to overtime. Marshall-U outscored Wilson 10-5 in the extra session, completing a 28-0 season with a 64-59 victory for the school’s only championship. On Monday Henderson and 14 other basketball greats were announced as inductees of the Minnesota High School Basketball Hall of Fame, the second class to be inducted. The hall was established last year. When the 1976 season began, Henderson may not have noticed Ludgate. He had been a score-first guard then, averaging more than 30 points per game, before coach Ed Prohofsky sat him down after the third game of the season. The Cardinals, Prohofsky said, had a chance to go much further if Henderson concerned himself with spreading the wealth instead piling up points. Marshall-U had plenty of scorers, like forwards Ludgate and Steve Newby and guard Rodney Hargest, but someone needed to feed them. Henderson changed his game immediately and Cardinals took off. He became so adept at distributing that he set the state tournament record for assists in a game, 14, that season, a mark that stood until 2006. He credits Prohofsky for turning him into the player he became. He went on to play college basketball at Augsburg University and was selected to that school’s athletic Hall of Fame in 2001. But his time at Marshall-U, which closed in the early 1980s, remains his most cherished. 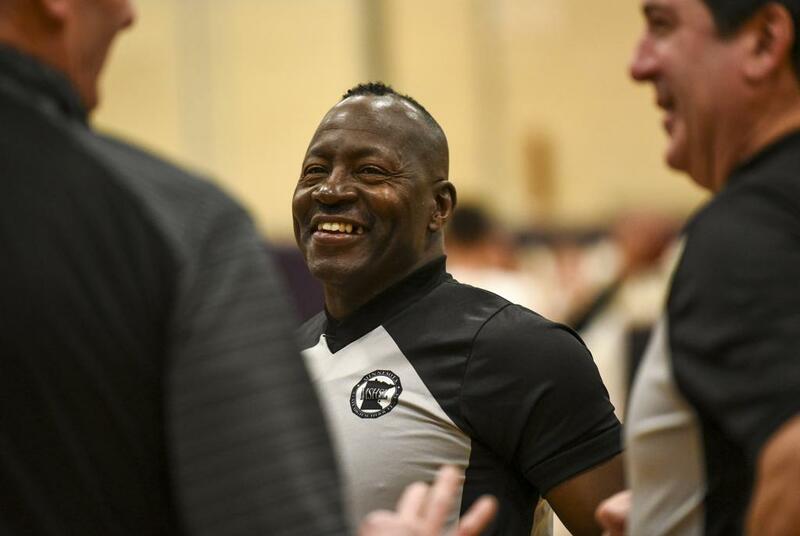 Henderson still resembles that compact sparkplug, moonlighting with a big schedule of officiating high school games and playing pickup games as often as he can. “I’m 60 but I feel like I’m 15,” he said. Time spent officiating has given him the chance to appreciate the high school game as it’s played today. As big as players have become, Henderson is proof that little guys can still have a big effect on the game. Choose your favorite picture from this season's coverage. State’s prep basketball Hall of Fame adds 11 players, four coaches. ©2019 MN Boys’ Basketball Hub | High School Boys' Basketball News, Scores & Standings / SportsEngine. All Rights Reserved.